Glenavon manager, Gary Hamilton was delighted with his side's victory at Windsor Park. 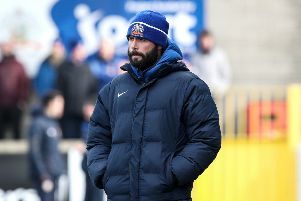 Glenavon manager Gary Hamilton insisted his boys deserved to win by a greater margin as the Lurgan Blues were applauded off the pitch following victory over Linfield at Windsor Park. The score line would suggest it was a tight, closely fought affair. That couldn’t be further from the truth. Goals from Simon Kelly, Andrew Mitchell and Marc Griffin cancelled out an early strike from Blues new boy Kurtis Byrne. Although Andy Waterworth pulled one back with practically the last kick, it failed to paper over the cracks -- the visitors should have been well out of sight by that stage. “Linfield have turned us over in practically in every game at Windsor since the 2015 Irish Cup final, so I told the boys to start believing in themselves,” said Hamilton. “I believe in them, so I just asked them to put on a show for the fans – show people how good you are. From one to 11, they were exceptional. I couldn’t have asked any more from any of them. “The only little thing that annoyed me was conceding a second goal so near the end – it took a bit of gloss off the score line. It suggests it was a tight game and we scraped through, which wasn’t the case. “Had we won by three of four clear goals, I don’t think anyone could say we didn’t deserve it. To me, their second goal wasn’t deserved. But we can’t complain too much, we got the three points what we were after. Fair play to the Linfield fans, they stood and applauded us off at the finish. “There are not too many teams that get an ovation coming off the pitch at Windsor Park. I told the boys to appreciate it because it’s not too many times that will happen in their career. “Linfield scored early on and when that happens, teams tend to fold, but that didn’t happen. We showed great character to hit back within five minutes. “We had a lot of possession and, perhaps my one little bit of criticism is that we didn’t turn that into goals. Roy Carroll certainly made some great saves, but our finishing could have been better.